Strawberry’s TaV-M.2 region is selected as one of RosBREED's "Jewels in the Genome," because this region is associated with fruit acidity and eating quality. Strawberry flavor is influenced by fruit acidity in combination with sugars and aroma compounds. Improving strawberry flavor is a high priority for breeding programs. Obtaining the optimum combination of these desirable taste attributes has been challenging because until recently, little was known about their inheritance. A locus, TaV-M-2, that affects acidity in octoploid strawberry fruits has now been identified near the top of linkage group V (Zorrilla-Fontanesi et al. 2011). TaV-M-2 was identified by phenotypic measurements of titratable acidity and pH. This locus is of particular interest because TaV-M-2 has been consistently identified near genes controlling variation for strawberry fruit color and the orthologous region in peach. The top of Prunus linkage group 5 also contains a major trait locus (D) that controls fruit acidity (Boudehri et al. 2009). TaV-M.2 was identified in progeny from a cross between two diverse octoploid strawberry selections, but the task still remains to identify the functional variations of this locus in strawberry breeding germplasm. The RosBREED strawberry crop team, including its international partners, is preparing to complete this analysis using pedigree-based analysis of genotypic and phenotypic data collected on the strawberry crop reference set (Fig. 1). Genetic knowledge of performance-enhancing TaV-M.2 variants allows strawberry breeders to begin predicting fruit taste, resulting in more efficient parental selections. Figure 1. 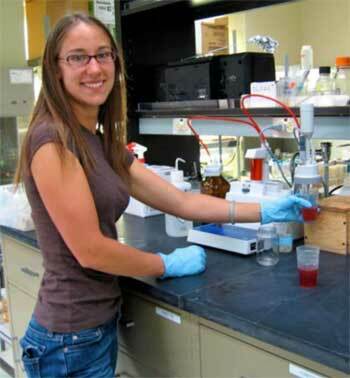 Megan Mathey, Oregon State University, measuring titratable acidity in strawberry. Photo credit: Oregon State University.